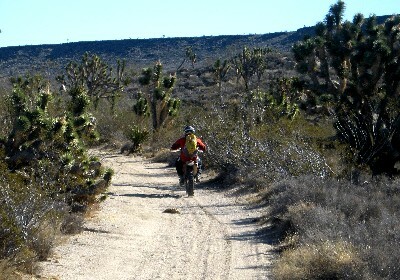 We last wrote about the Mojave Trail (a.k.a. the Mojave Road) after our year-ago sojourn south during the 2007 holidays. That adventure was characterized by bone-numbing cold (on the long first day). What, we thought to ourselves, are the odds that we'd encounter such weather two years in a row? After many years of racing at Willow Springs Raceway in nearby Rosamond through the winter months I had come to expect cool conditions in the California high desert this time of year but no full-blown winter gales. This position may require some rethinking. The drive down from Idaho on the 25th of December was in the midst of one of the larger blizzards to strike the western USA in recent years. At Beaver UT the local authorities chose to close I-15 (a mere 20 miles north of snow-free roads) and we were forced to improvise an alternative route. After many hours of wandering the snowy deserts of Utah that night we arrived at the AVI Casino, on the banks of the Colorado River in Laughlin, NV, in the wee hours of the morning. We were heartened to discover that the temperatures were in the mid-40's - at least 10 degrees warmer than the previous year. We laid our heads to rest with the sure knowledge that the morning would bring clear skies and the warmth we'd been missing for about 6 weeks in Idaho. Friday morning the 26th dawned stunningly clear and pleasantly warm. After a leisurely breakfast we wandered out of the casino into the sunshine and immediately began losing layers of clothing. Oh yeah! This is what we'd signed up for. My uncorked XR650R, notoriously difficult to cold start, fired up on the first kick. All the signs and portents for a relaxing, warm and pleasant desert excursion were good. Our mirth lasted exactly as long as it took for us to reach the crest of the Dead Mountains a few miles west and 1500 feet above Laughlin where we were greeted with a westward vista that included the sun drenched Piute Valley (good) and the snow-covered New York Mountains (not so good). While stopped to layer back up I had a chance to examine my right pinky finger which was swollen and purple and dislocated as a result of being whacked by a limb from a Joshua tree that somehow evaded my brush guard. Ten miles into the ride and we were already battling the elements and injuries. What next? two years in a row to guess correctly on the environmental conditions. As prognosticators of the weather we are complete bust outs. 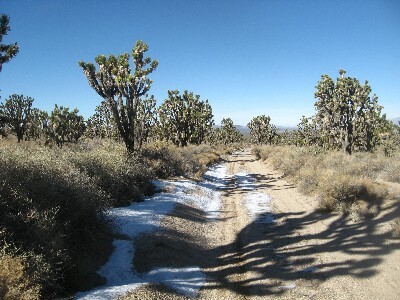 The Lanfair Valley was a surreal tableau of Joshua trees and snow. Snowy sand provided a traction challenge that we figured, with some experimentation, could best be addressed with lots of throttle. In spots the snow was quite deep and we even encountered the occasional drift! Tres cool! Point, shoot and go. Unfortunately the snow covered sand, with little warning, turned to icy mud on the west side of Cedar Canyon Road providing several moments of unanticipated excitement as we discovered the change in traction - providing perhaps the most invigorating moments of the entire ride. Clouds were gathering as we dropped down out of the mountains to the Kelso-Cima road. Nothing, however, could possibly put a damper on our enthusiasm for the next section of the trail. Ahead was a spectacular landscape that included the Kelso Dunes, the Beale and Marl Mountains and Cima Dome to the north. 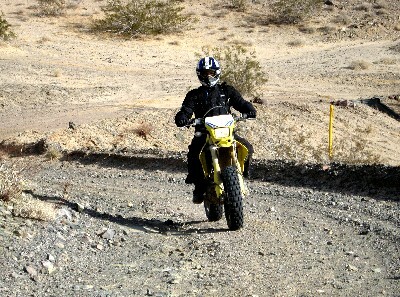 But we were focused like a laser beam on the whoops - 12 miles of them up to the Mojave mailbox. Yeehaa! 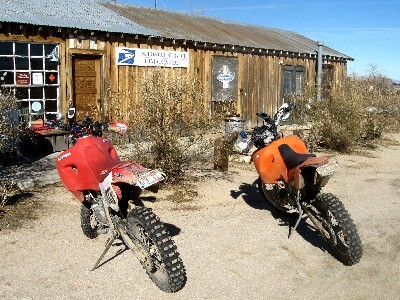 We Hancocked the register at the mailbox and proceeded down Willow Wash to KelBaker Road. Then westward on Hidden Valley Road which descends gently into Soda Lake. Occasionally we noticed a brightly colored sign off to the side of the road but they were difficult to read at speed and we were having too much fun to slow down. Soda Lake is a vast seasonal lake south of Baker, CA (during rainy season you have to detour around the lake - doh!). The Mojave Trail crosses the southern part of the lake but our plan was to detour north across the dry lake bed to Baker for gas and to meet our friend Steven who was riding over from LA to meet us then to ride back down after lunch. As we were a little behind schedule we stopped a few miles short of the lake to call Steven and in the interests of time ask him to ride out and meet us at Traveler's Monument in the middle of the lake. This is where things began to go awry. Christmas, Kwanzaa or Hanukkah. Nope, they were warnings that Soda Lake was closed due to flooding. Our subsequent frenzied attempts to reach Steven on his cellphone were to no avail as he'd turned it off. Dan and I rode around the eastern edge of the lake north towards Baker, certain that we'd encounter Steven coming south. The afternoon light was optimal for photography and I asked Dan to ride ahead so that I could shoot some video. Dan, gleeful of the vast, mostly dry edge of the lake, was not quite so mindful as he should have been for the potential to be swallowed up by innocent looking sippy holes. I swear an oath that I mistook his hand gestures as an indication that he was OK before I blew by and roosted him. It took 15 minutes and a terse text message before I discovered the error of my ways. Oops. Dan got his bike dug out just before I got back to him and we proceeded to Baker. We hoped mightily that Steven would realize the error of his ways (listening to us) and return to our previous rendezvous at the Bun Boy in Baker. And though it took a while that's eventually what happened. The joy of our reunion, however, was tempered by the fact that it was about an hour away from sunset, the temperature was dropping, and we had about 75 trail miles to go to get to Barstow. Rather than take a chance in a wet Afton Canyon after dark we elected, instead, to head north out of Baker about 10 miles to the powerline road that parallels the interstate nearly all the way to Barstow. Somewhere in the brutally exposed trailer ride down to Laughlin, or perhaps during the bashing the XR had taken in the whoops, my wiring harness had developed some faults. The big 8" race light shone feebly on high beam while the HID light flickered on and off. It was during this time that I discovered an inconvenient feature of otherworldly bright HID lights - which is that when they go off the world becomes otherworldly dark really fast. A breathtaking event, I should add, when it occurs at desert road speeds. We lost Steven once in a large sippy hole but other than that the ride to Barstow in the dark was more enjoyable that I would have predicted when we left Baker. After 60 miles of feeble and intermittent lighting (precipitating an occasional panic-induced squeeze on my brake lever with enough pressure to convert a lump of coal into a shiny diamond) the wiring harness on the XR magically sorted itself out at nearly the exact moment the lights of Yermo came into view. I know that vagaries shouldn't dent one's enthusiasm for a pilgrimage but sweet Jesus can't a brother catch a break with timing? The following morning arrived clear but very cold. All of the talk at the hotel breakfast bar was of the extraordinary chill. Oh well - at least we'd have the sun's rays shining on us throughout the course of the day with no danger of heat stroke. Our route east from Baker took us to Mule Canyon in the Calico Hills - a truly unique landscape. We followed Mule Canyon Road back around to the powerline road and reversed our course of the previous night. This time we were able to enjoy the vast sandy expanses interspersed with the occasional low mountain range. We rolled into Baker at about 2:30 in the afternoon and decided to call it an early day. As we were unloading the bikes in the parking lot of the hotel we discovered that Steven, somewhere in the excitement of the previous 24 hours, had blown out both fork seals on his DRZ400. Being the tidy and meticulous fellow that he is Steven had no sooner discovered the problem than he had an appointment to have them replaced upon returning to LA! Now that's class. Being the laggards that we are the the rest of Team Hillbilly/No Worries is accustomed to riding on, after the first signs of seepage, until the forks start to act like pogo sticks. No wonder Steven's bike always looks as if it just rolled off the showroom floor. hotel. Seldom, we think, has anyone walked so far in the cold for a warm Budweiser. We bid adieu to Steven the next morning and set off on the third and final leg of our journey. This time via new and unfamiliar terrain over Cima Dome and nearby Teutonia Peak. We spent an hour or so on the northern part of Soda Lake shooting some video, then proceeded east toward the mountains. 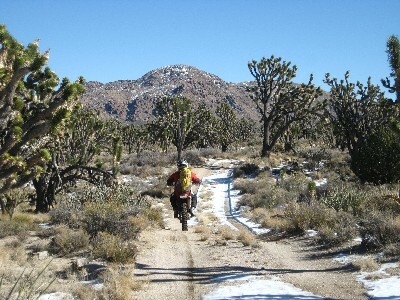 This section of our loop around the Mojave Preserve gets our nod for the best of the best. As we climbed 4800' from Baker to Teutonia Peak the views became increasingly spectacular. Near the top of Cima Dome, on a brilliant day with temperatures around 50, we encountered the deepest and most persistent snow of the trip. Roosts from our tires formed glittering crystalline rainbows in the midst of a stunning landscape. We discovered what may be one of our favorite trails - the only thing is that we didn't mean to. As is my habit I ignored my GPS and blew past a turn on our planned route and didn't discover the error for several miles. Rather than turn back we improvised and it turned out to be one of the luckier mistakes in navigation of my experience. Mid-afternoon found us at the fabled Cima Store where the proprietors, who happened to be there on a day when they were normally closed, opened up and served up a proper lunch of soda pop and barbecue Fritos. After a brief respite we were off toward Ivanpah and the New York Mountains. 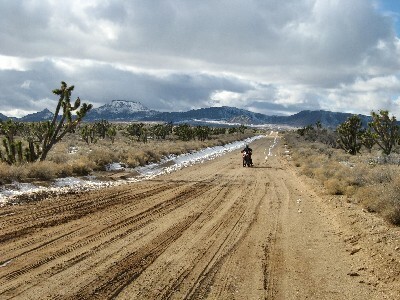 Part of our route toward Ivanpah followed an old roadbed that had deteriorated into occasional sections of asphalt interspersed with deep sand - with transitions that demanded attention. 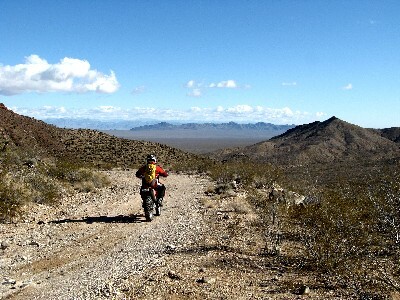 After a few miles we veered south along a trail across the desert towards Ivanpah-Lanfair Road. It was here that a recent legacy of the heavy rains nearly wreaked catastrophe on our humble adventure when I bottomed out in a deeper-than-expected dry wash across the trail so hard that the compression of my spine numbed my hands for several minutes. We traversed the Lanfair Plain again but this time from Northwest to Southeast and discovered a spectacular view of the Piute Valley and Fort Piute from the head of the valley in which it sits. A left turn onto Cableline road and the final 20 miles across the Piute Valley and over the Dead Mountains were the stuff that good dreams, lots of suspension, and steering dampers are capable of conjuring. The total length of our Mojave loop is around 380 miles. It could easily be done in two wonderfully relaxed days if one knew the way, didn't lose bikes in sippy holes, could follow directions, etc. 7. Near the summit of Cima Dome - Baker and Soda Lake in the background. The Mojave Road Facebook Page.